We love how simple this card is to put together, it looks so elegant and can be used for a number of occasions. 1. 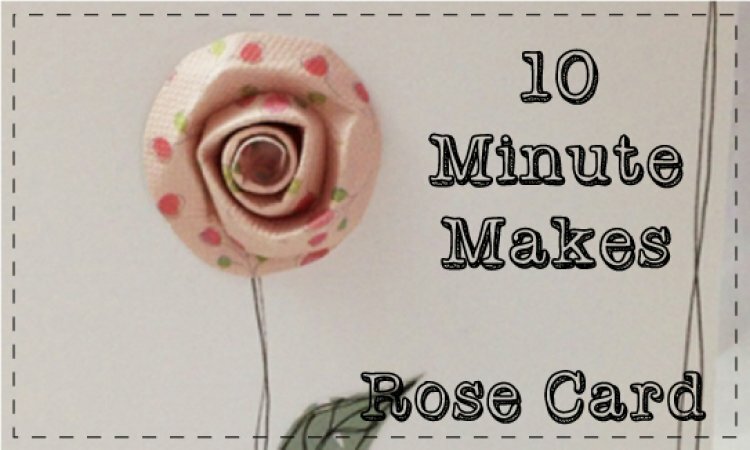 Firstly make the Rose by cutting a rough circle approximately 1.5” in diameter. 2. Leaving approximately 10mm from your cut line to the edge of the circle, cut into the circle following the line to the centre of the circle to create a spring effect. 3. Starting from the outer edge create a rough crease line in the middle of the 10mm wide card until you come to the centre, creating a ‘mountain’ effect. 4. Again starting from the outer edge roll the roll in on itself. The tighter you roll, the smaller the rose. 5. Once you are happy with your rose, apply wet glue to the underside and adhere to itself. 6. When dry adhere to card front. 7. With a fine liner pen draw freehand lines as a border on the front of an A6 white card. 8. Draw another freehand line for the ‘stalk of the rose’. 9. Cut a leaf from green patterned paper and draw veins, adhere to card front. 10. Add sentiment to card front. This card is a real craft skill essential and is great for when you’re short of time. We can’t wait to see your versions in the project gallery.